Time does funny things in the desert.....sometimes it reveals an entire ocean, it's frozen tide pools and fossilized sea creatures, below, ebbing for a moment, it's currents. I am always impressed by the notion that I walk on the bed of an ancient ocean. 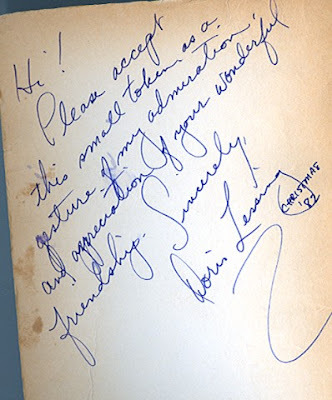 One of the stories by Ursula K. Leguin I love is "The Masters". In that tale a medieval astronomer, perhaps an astrologer or an alchemist, is driven into hiding underground in mine shafts. There, he discovers "the stars beneath".........the Hidden Sky. Here's The Hidden Sky: Fibonacci Movie from Cara Reichel on Vimeo, in conjunction with a 2010 play based upon Ursula Leguin's story. It's so beautiful, I felt like looking at it again. 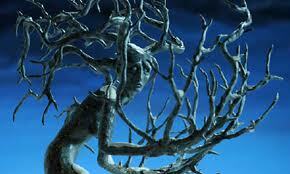 The Hidden Sky: Fibonacci Movie from Cara Reichel on Vimeo. Writers are often asked "How do you write?" But the essential question is: "Have you found a space, that empty space, which should surround you when you write?" Into that space, which is like a form of listening, of attention, will come the words, the words your characters will speak, ideas - inspiration. If a writer cannot find this space, then poems and stories may be stillborn. When writers talk to each other, what they discuss is always to do with this imaginative space, this other time. "Have you found it? Are you holding it fast?" Since I tend to think of synchronicities as a form of grace and message, this was an important one that I've pondered on often. 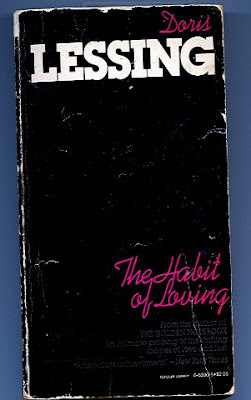 I've been reflecting that the habit of loving is the only truly necessary habit to cultivate. We're often "tapped on the shoulder" by angels, and pre-occupied with daily concerns, we fail to notice miracles fluttering like their translucent wings under our very noses. 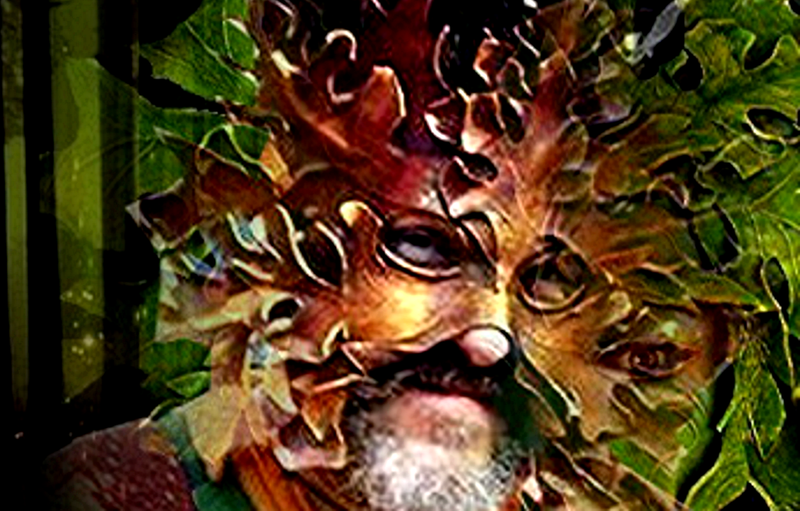 Ecologist and philosopher David Abram has commented that perception is "a reciprocal phenomenon organized as much by the surrounding world as by oneself". He suggests that a two-way dynamic of energy exchange may be going on. In contrast to our idea of a non-living world we simply observe or act upon, Abram asserts that "the psyche is a property of the ecosystem as a whole", suggesting that we move beyond the notion that "one's mind is nothing other than the body itself". Another way of putting it might be that we are "ensouled" in the whole world, a Conversant and Responsive World. As writer Alice Walker has said, "the Universe responds." "I've been depressed this winter, which led me to go into therapy to tell some of the stories of my personal life, and hopefully untangle them so I can move through the bardo of transition I've been mired in........the Habit of Loving is the discipline from which creativity arises, and without it's hopeful window, the river dries up. I've been blessed to find a wise counselor to listen to me. And in the "unmasking process" (as she puts it) I've often felt like a ghost within the "legend" of my former self.......therapy is rather a painful process!" I reflect again, being at the end of my therapy, the message of the title of that little book. The habit of loving, especially in the dark times of ones life, is a discipline to hold to. A way to live. In her Nobel speech, Lessing remembers her life early life in Africa, in Zimbabwe, formerly Rhodesia. She urges us to remember how precious the gifts of literacy really are, remembering how desperately important it is to those who live without schools, or books in her former homeland. Here is the speech, from the Nobel Prize site. "We have a bequest of stories, tales from the old storytellers, some of whose names we know, but some not. The storytellers go back and back, to a clearing in the forest where a great fire burns, and the old shamans dance and sing, for our heritage of stories began in fire, magic, the spirit world. And that is where it is held, today. Ask any modern storyteller and they will say there is always a moment when they are touched with fire, with what we like to call inspiration, and this goes back and back to the beginning of our race, to fire and ice and the great winds that shaped us and our world. The storyteller is deep inside everyone of us. The story-maker is always with us. 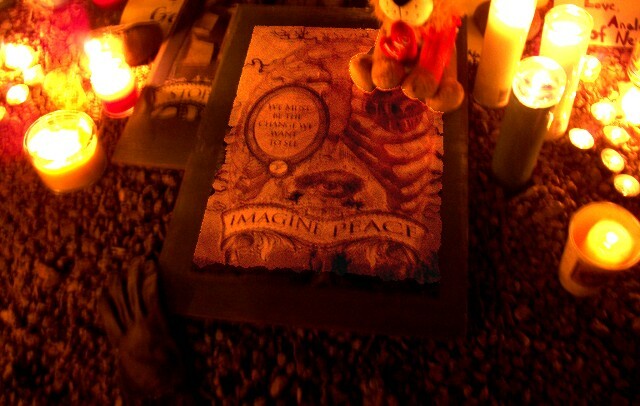 Let us suppose our world is attacked by war, by the horrors that we all of us easily imagine. Let us suppose floods wash through our cities, the seas rise . . . but the storyteller will be there, for it is our imaginations which shape us, keep us, create us - for good and for ill. 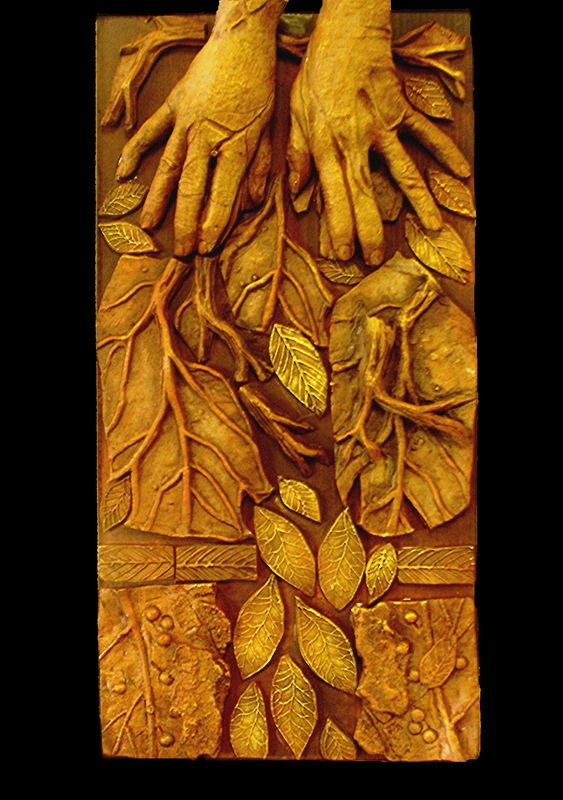 I wanted to write about the theology of community for the 7th Annual Conference on Pagan Studies at Claremont School of Theology (this coming weekend in Los Angeles, California) - to write about our need to sanctify community, human and planetary. 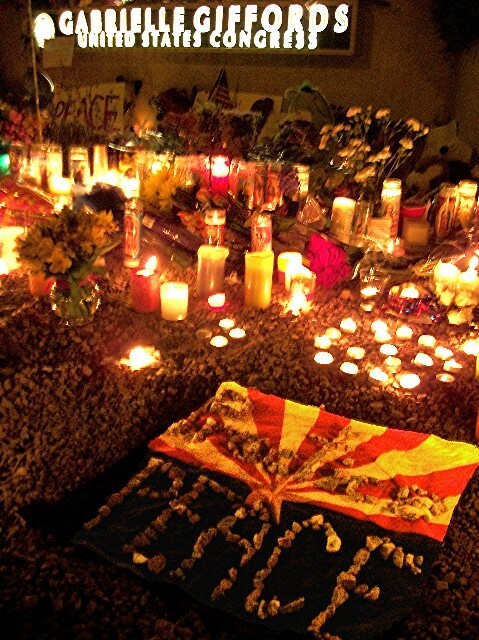 Having been witness to the tragedy in my home town of Tucson, I' ve been almost unable to think in terms that are too abstract. When confronted with the horror of violence, and the heavy pall of grief, the need to experience inter-dependence, with-in our bodies and with-in the refuge of our imaginations - is very real and immanent. We want to know we are not alone, we want to support each other. I was struck by the way "Together We Thrive" became a theme echoed throughout Tucson, and headed healing activities, from the President's call for unity, to spontaneous Shrines created at Gabrielle's Head Quarters and elsewhere that called for peace. We urgently need pragmatic ways to create community in today's world. Could a strong community have prevented what happened? Unbalanced individuals will always abound, and lethal weapons are readily available - the American gun culture will ensure this is not the last such event. Yet even so, the failure of community speaks to this tragedy. If we weren't in so many ways a culture of "rugged individualism" where "good fences make good neighbors", and our technology increasingly allows us to insulate ourselves from the so-called "outside world" ... would this young man have received the attention, even healing, he needed before he erupted in catastrophic violence? "The Rugged Individualist" writes sociologist Philip Slater, "cheers when needy people are deprived of food, battered women are deprived of protection from brutal husbands, children are deprived of education, etc., because this is "getting government off our backs. " This kind of thinking fails in every way to communicate that we live within a vast web of human and environmental inter-dependency, a web that is also very intimate. A successful adult is so because of parents, teachers, community resources, and distant ancestors that enabled him or her to mature. And without a sense of belonging and contributing to that continuum as it reaches into future generations, human beings end up feeling alienated and ultimately without a sense of purpose. They feel disposable, and perceive others as equally disposible. Which is what an unsustainable consumer system, as a placebo for the pain of spiritual and communal isolation, feeds on. In tribal societies, survival depended utterly on cooperation, as well as the collective ability to adapt continually to new environmental challenges, be it drought, invaders, or the exhaustion of resources. The mythic foundation of any tribe (or civilization) is the template upon which they stand; a culture with a rigid mythos that cannot adapt and change is doomed to collapse. "We live in a world today in which the problems we face are all planetary..........." Philip Slater comments in his new book The Chrysalis Effect, "the polarization and chaos we see in the world are the effect of a global cultural metamorphosis". We need a new mythology for the global tribe. Renunciate theologies that teach us to renounce the world, the body, and relationships, either in service of some abstract "better place" (be it heaven, paradise, enlightenment or nirvana) or in reaction to teachings that degrade earthly life as "impure" or "unreality"..............will not help us, or those who must come after us. If we're going to speak of "oneness", we need myths that include tremendous, creative diversity within that "oneness", that can include many gods and goddesses, many voices and languages, and many ways to the truth instead of simply eliminating the competition. 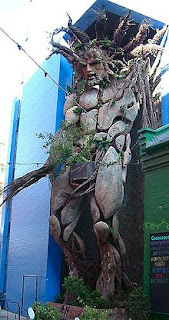 Further, our world myth can no longer be simply a human world myth - it must include many evolutions, many other beings within the intimacy of ecosystems. If we're to survive into sustainability. "The culture that is holistic is holistic because its reasoning structure is holistic." wrote artist Rafael Montanez Ortiz. "The problem we have with holism is that our reasoning is fragmentary, dissectionist, it removes us from relating things, it structures things in separate compartments in order to "have control". Ortiz maintains that if the logic of one's society is relational, you are in relation to all things, and thus, empathic to all things. 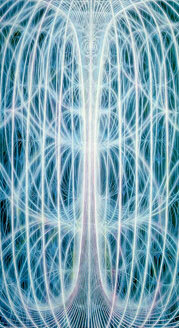 In earlier societies, the entire world was alive, entangled, conscious, animistic and full of Anima. It's no coincidence that this "primitive" worldview is very close to what science, from Gaia Theory to Quantum Entanglement, is discovering. Last, myths, as in all tribal societies, become meaningful through embodiment, through actual experience - through ritual. 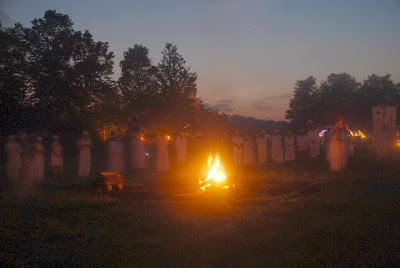 And that's an endeavor the Pagan community is really good at, a skill we can offer that's tremendously needed. Our brains aren't just in our skulls, but the entire body, which includes the aura and the etheric networks that exist between us and the rest of life. Whether we're talking about a forest, or another person, abstractions can remove us from the experience of communion, the immanent ability to sense what is going on. Abstractions become what is going on. 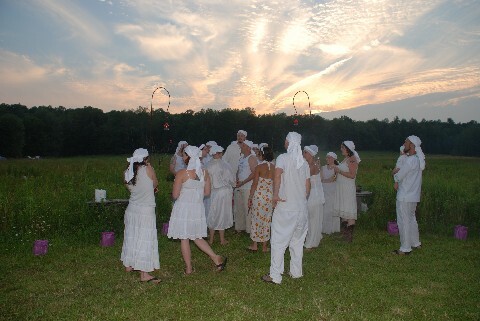 I know there are many here who have experienced, and helped to create, rituals that were profoundly transformative. My experiences of the Spiral Dance with Reclaiming, or with the Earth Spirit Community's Twilight Covening, or the Lighting of the Labyrinth at Sirius Rising......will always energize me when I remember them, no matter what. 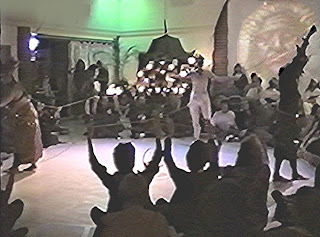 Within those magical circles, I entered mythic time and mythic space, experienced, as Joseph Campbell put it, the "Thou" realm of existence. That does not end when you leave the circle. "The work of our group is not to re-enact the ancient goddess myths, but to take those myths to their next level of evolutionary unfolding. 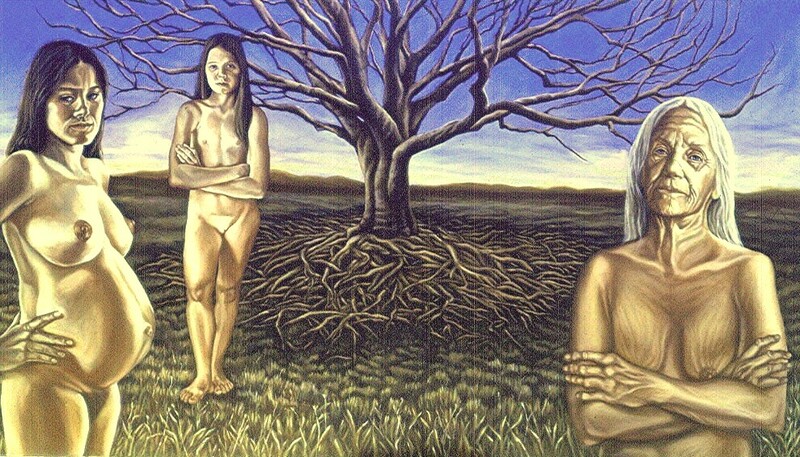 The integration of male and female must occur in order to bring balance to the earth and holism to human consciousness. A dialogue needs to occur so the pain of both may be brought to light and transmuted." 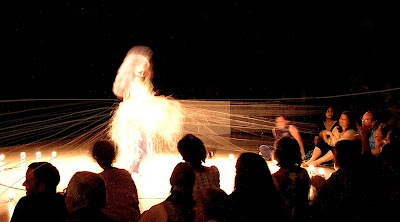 In my own rituals, I've felt that Grandmother Spider Woman has given me the compulsion to weave webs, from simple rituals in which we tied threads, naming what we were re-connecting with in our intentions, to dancer Morgana Canady weaving a web as "Spider Woman" in a theatrical performance with 300 people. In this instance, biodegradable cords from “Spider Woman’s Web” were later distributed among cast members, and scattered throughout the desert, symbolically extending our web. 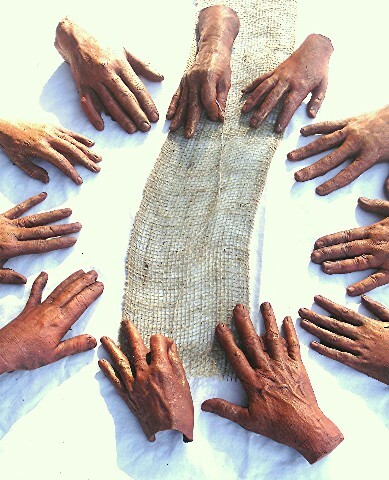 As part of the Global Art Project as well, an exchange was made with the AFEG-NEH-MABANG Traditional Dance Company, in Cameroon, a part of the weaving. 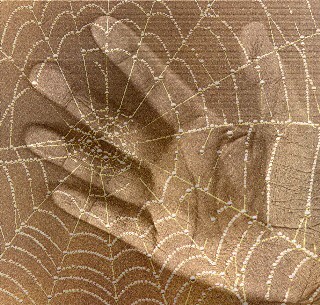 Among the Navajo, infant girls often have a bit of spider web rubbed into their hands so they will become good weavers. 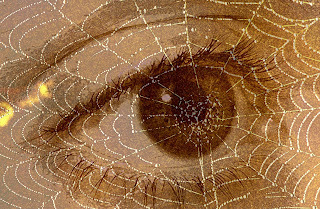 May we all now rub a bit of spider web into our hands..........and, like Penelope, may we all now see "with a web on our faces". "Every life is a story and a story can change the world"
I saw a movie last night that I felt like sharing, MYTHIC JOURNEYS created by Steven and Whitney Boe. 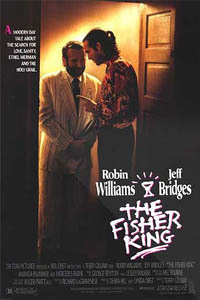 Joseph Campbell would have loved this movie, and so did I. You'll feel my breath, warm at your neck. I will rise in the grass, a vine caressing your foot. the shining leaves of tomorrow. I'm not sure why, but I've felt a compulsion lately to make Green Men masks. 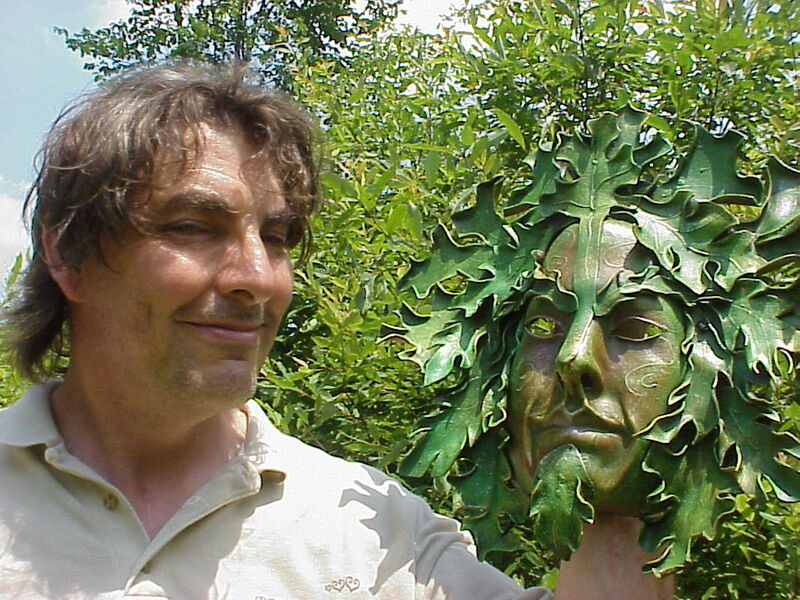 I've made, probably, thousands of Green Men masks in the past 30 years. 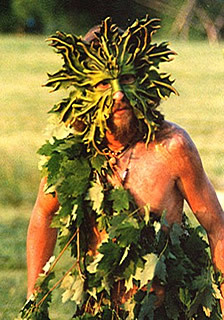 I guess that's my claim to fame - I've helped to populate the world with masked Green Men. It's a messy job, but someone had to do it. Some of my masks have been copied so many times by other mask makers that I'm practically generic. The Green Man is such a potent, positive symbol of the renewal of life. 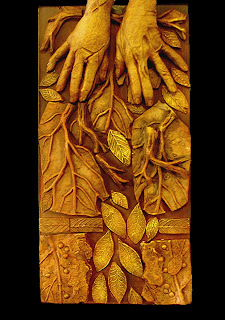 In the company of the Green Man ** one finds the male as healer and renewer, instead of warrior............and a pretty darn good symbol for our time as well. 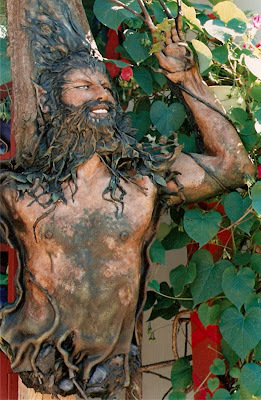 May we all find ways to dance with the Green Man! "At a time when our discourse has become so sharply polarized – at a time when we are far too eager to lay the blame for all that ails the world at the feet of those who think differently than we do – it’s important for us to make sure that we are talking with each other in a way that heals, not a way that wounds. 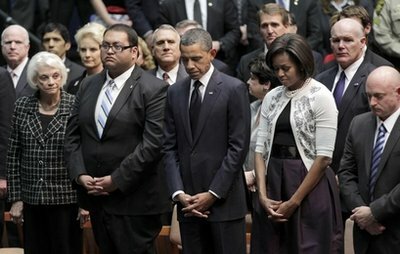 What we can’t do is use this tragedy as one more occasion to turn on one another. Rather than pointing fingers or assigning blame, let us use this occasion to expand our moral imaginations, to listen to each other more carefully, to sharpen our instincts for empathy, and remind ourselves of all the ways our hopes and dreams are bound together." Last night I saw the President give an extraordinary speech here in Tucson, with an astonishing 20,000 people turning out to hear it, that called for peace, reconciliation, and reason. I read some cynical journalist comment that "it was mostly college students" - I respond, so very good to see that. They are the ones inheriting the future. He concluded by talking about the young girl (born on 9/11 and included in the book "Babies of Hope") who died - grieving for her and her parents, and making a plea for a better world for all children. He was never more eloquent, and I felt that this speech, and the extraordinary international response to this violence, ended with a important message for our world. I also was delighted to see a Yaqui elder call on the Directions for healing and balance, honoring the first Americans, and cultural diversity. On a trajectory, I've seen the recent movie "The Kings Speech" twice, and love it. Seeing this story of George the 6th, who was a stutterer, struggling to serve his people with speeches that were so very difficult for him to perform on the terrifying brink of WWII, I never before understood the significance of the Royalty as the "voice of the people" in England. There are scenes in that movie that will make you cry. I understood the same thing last night when President Obama spoke. I'm facing one of those glorious sunrises Arizona is famous for. Tonight the President will be speaking at my Alma Mater, the University of Arizona, and people are camped out in front of the stadium last night, waiting to get in. Unless I stand in line all day, I probably won't be able to get a seat, but I'll watch on TV, and put another candle on the memorial shrine. As I watch the lovely flickering of candle flames, I'll reflect on how many kind, compassionate, caring and gentle people there are everywhere. Those who died will be buried, their families will continue to grieve. Those who are wounded will heal the best they can. Gabrielle will spend her energy trying to physically heal, re-learning, if she's lucky, how to walk, or feed herself (if she survives), and we will have lost her wise voice and advocacy. In little more than a week, the media will forget all about the rampage. Until the next time some crazy, homicidal young man, who's grown up on a steady diet of ubiquitous "might makes right" militaristic video games, movies, TV shows, and toy guns......goes to the corner gun shop and buys a sub machine gun and destroys the lives of another round of families, the peace of another community. And the truth is, if you live in Baghdad, or Juarez, or any number of other places that aren't as wealthy or high profile as Tucson, this kind of thing isn't really any big deal. It happens all the time, and people try to live their lives in spite of it. Why is it always a "young man"? I remember reading a sci-fi novel from the 70's that envisioned a planet where all the men had died, and the women had to reproduce by cloning. They didn't want men to be re-introduced to their planet because they felt their "hormones" made them too dangerous to a peaceful civilization. I think I once naively wondered if men, especially when they're young, are doomed to violence because they have bad hormones, but a look at the many men who are the worlds great peacemakers consensus makers and teachers and humanitarians demonstrates that the argument I used to hear in the 50's that "biology is destiny" does not apply to men any more than it ever did for women. But I do agree with Riane Eisler, who has written extensively that patriarchal values are a self-perpetuating mythos, glorification, and template of violence. Without the evolution of what she called "partnership societies", we really don't have much of a global future at all. I know, Sarah is too easy to lay blame on. It's just that my little corner of cultural transformation has been about a rejection of militarism, and a concern with Earth-serving reconciliation ("earth" derives from the same word roots as "hearth" and "heart".) Were the societies Eisler wrote about, Minoan Crete, or Old Europe, ideal societies? I doubt it. But it does look like all their art and ritual were not concerned with military conquests, sword waving kings, and warrior gods wrathfully destroying the blasphemers. Leaving them, presumably, a lot more time to trade, make art, value children, and work at improving the lives they had. 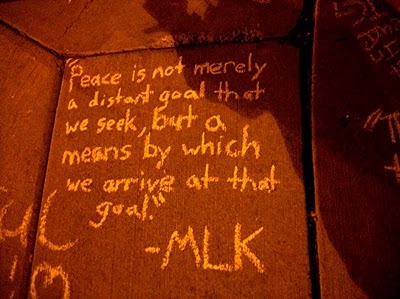 What kind of world would we have, if our "Department of Peace" was as big, and as focused on "technologies of peace" as our "Department of Defense" is? (Do we even really have a "Department of Peace"?) Tucson has an air force base, and a huge munitions manufacturer (Raytheon). Big economics, the economics of war. 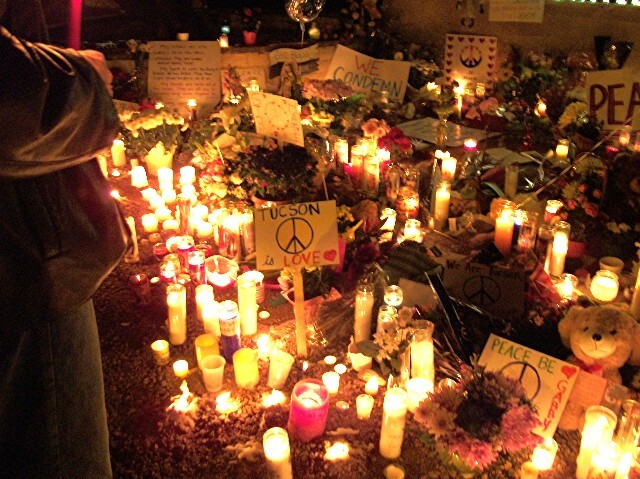 Tucson does have a Peace Center, which I imagine a lot of smaller cities don't. It's been around for at least 20 years. But it still hasn't managed to come up with enough money to rent an office. **Pulitzer Prize winner Jared Diamond, in his brilliant book "Collapse", has pointed out that the cattle and dairy industry in, for example, Australia produces more environmentally destructive greenhouse gases through the emission of methane than the impact of all the motor vehicles in the country. It's also worth mentioning that the majority of rainforest cut down in Brazil is to produce grazing land for cattle. 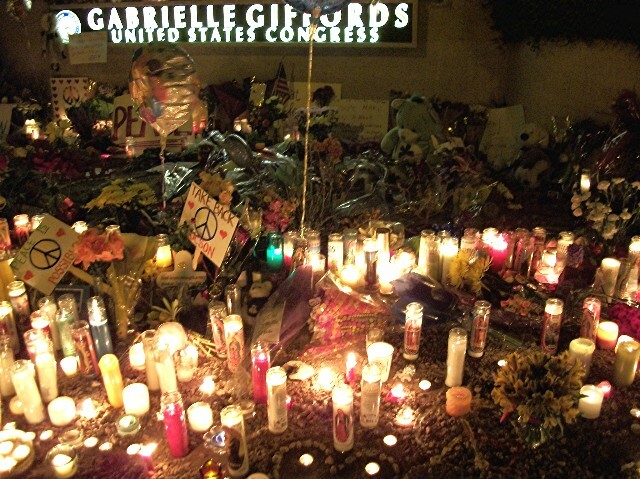 I wanted to post these photos of the candlelight vigil for Congresswoman Gabrielle Giffords and the others who were killed and wounded. Peace over the state flag. Someone left a card that said "And love will hold us together and give us shelter to weather the storm." 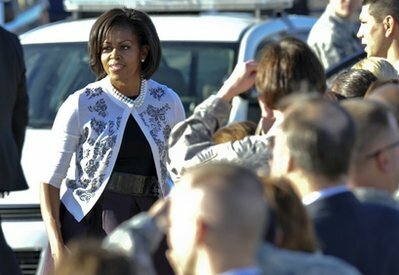 It was a beautiful and moving experience to see the altar made at her headquarters on Pima and Swan, which continues to grow. 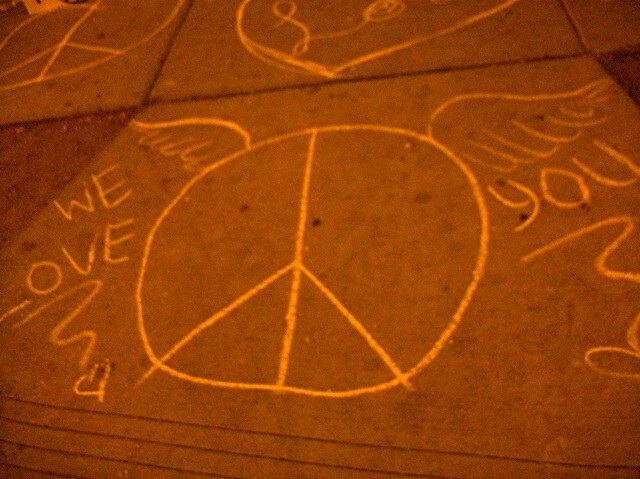 I was very struck by the many messages people left about Peace. 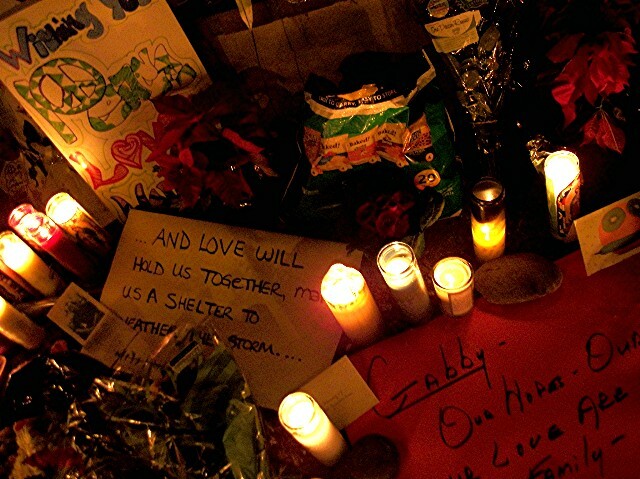 Not just a blessing and prayer for Gabrielle and for the the others, but for our nation and our world. I truly felt that. And, perhaps because I'm an artist and always struck by the living metaphors all around us, as I walked back to my home, I passed by the building next door to Gifford's headquarters and the Altar, where many people had parked their cars. 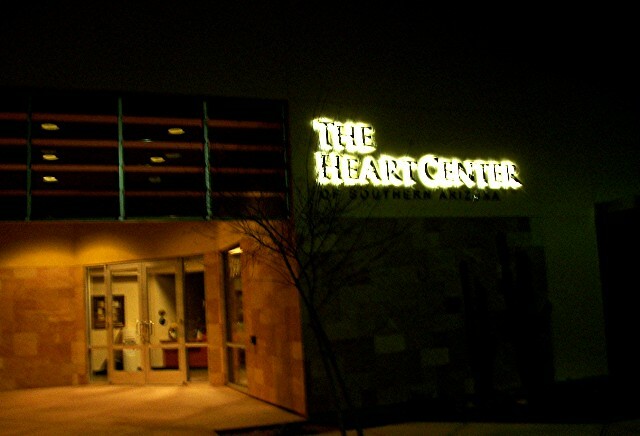 It's a medical plaza called THE HEART CENTER of Southern Arizona. I'm very saddened by the shooting of Democratic Rep. Gabrielle Gifford, leaving her critically wounded, 6 people dead including a 9 year old girl ironically born on 9/11 and called one of the "Hope Babies". 14 others were wounded. There's no need to go into the details, as the news is international. 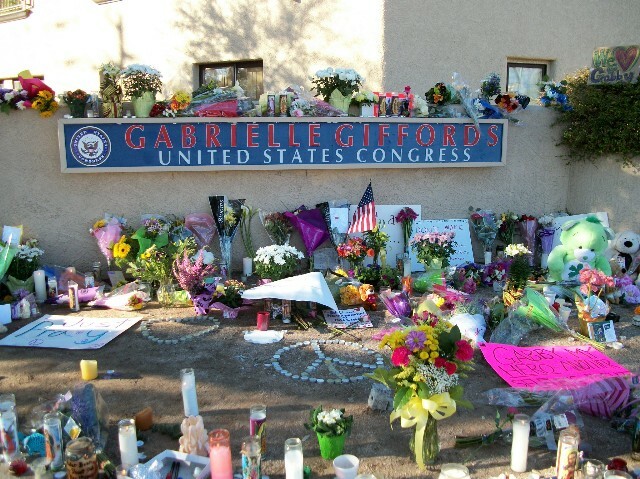 Gabrielle's office is just 3 blocks from where I live, and last night I placed a candle and flowers at a vigil held there for her (there were others, including where she is being treated at UMC hospital.) The intersection near her office was blocked off before the vigil, because a suspicious object, presumably a bomb, was reportedly found and defused. I heard this after I arrived, and don't know the details.....but if so, this gunman was not alone in his hate campaign, or there were people who took advantage of the tragedy to provoke further threat of violence. Tucson is fairly well known as a (sort of) liberal oasis in an otherwise conservative state with a lot of "cowboy" ethics still abounding. In Arizona, for example, you can legally carry a handgun (in a holster). I'm not going to write about that, or the mythos and insanity of the gun culture, because there's way too much to say. 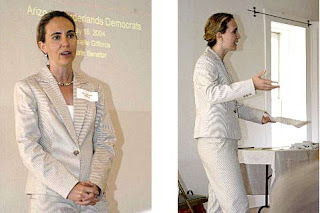 I do want to say that the last election was the ugliest, most irrational I have ever seen, with a kind of simplistic, violent propaganda focused against Giffords, and Democrat Raul Grijalva, that I don't remember ever seeing before. Even the most politically apathetic noticed it. Some of the "allegations" on the internet or over TV were comparable to the insanity of calling President Obama a Muslim terrorist. 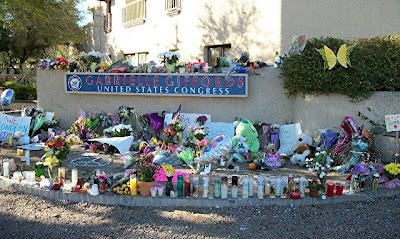 One example I found particularly disturbing were thousands of cardboard placards placed at intersections all over town with blurbs like "Giffords supports the Taliban". Just a few days ago, even though the election is well over, I noticed a placard near her headquarters that said: "Giffords took away my medicare". 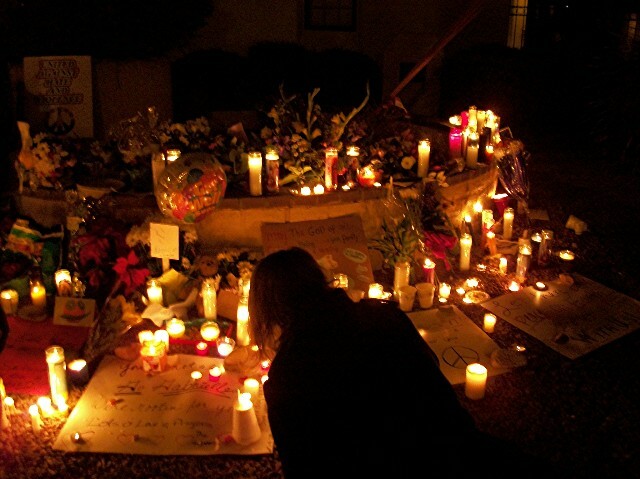 For many this extraordinary hate campaign was very much on our minds as we lit our candles. "On her Facebook page last spring, (Sarah) Palin posted a U.S. map with crosshairs of a rifle scope over the districts repped by Giffords and 19 other Democrats.” ..................."should we pretend that the violent rhetoric of Palin and her followers is “just an overheated metaphor,” asks Huffington Post writer Marty Kaplan. How many times have we heard Jon Stewart and others speak out about how the GOP-Tea Party machine, with its angry bombast, pushes people? This “lock-and-load” mentality is today’s U.S. politics–reptilian, raging, uncivil, unyielding and here, possibly murderous. UPDATE 1/9/2011: Even a senior Republican senator, speaking anonymously to Politico.com “in order to freely discuss the tragedy,” believes the Giffords shooting is a “cautionary tale.” “There is a need for some reflection here – what is too far now?” said the senator talking about inflammatory language and suggestions of violence in politics." This is not only a political matter; it is also a spiritual matter. 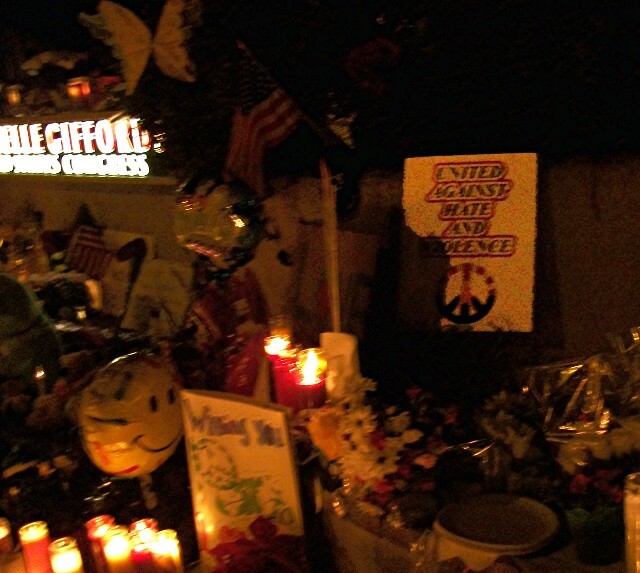 The "altar" created for Giffords and all the others included prayers for peace, a butterfly, a peace sign, and many, many candles with the image of the Virgin of Guadaloupe - people know that we must all hold reason, hold the peace, now, more than ever. I'm not much of a dreamer - if I do remember a dream, it's a rare event, and I roll it around for years, because I figure if a dream is memorable, it's the psychic equivalent of my unconscious throwing a brick at me. But perhaps because I'm a visual artist and close attention to symbolic language is intrinsic to art process, I've come to think of synchronicities as akin to "waking dreams", many layered and mysterious. Art process is as seamless, I believe, as dreaming, and partakes of the same weave as the attention that enables us to experience synchronicity. Synchronicities are threads from the loom of Spider Woman, woven into a vast pattern; but they can also be funny, and deeply personal as well. I often feel compelled to write about them, without necessarily understanding them, just as with dreams, their "meanings". In the course of blogging this past year, I've been fortunate to meet others who've inspired and contributed to my appreciation of this phenomenon, among them the Macgregors, authors of the book The 7 Secrets of Synchronicity, and Robur D'Amour, author of two blogs, who wrote recently wrote two fascinating articles about Lady Godiva and the Grail). I've been exploring the weird synchronicity of finding myself singing a 60's song about Lady Godiva in several posts the past month, and its led me down a mythic and her-storic trail to the Great Goddess, submerged and re-emerging into our world now. Perhaps most personally, the threads of this synchronicity have helped me to rekindle my passion for my work with the Divine Feminine, re-energizing me as I flounder around these days. 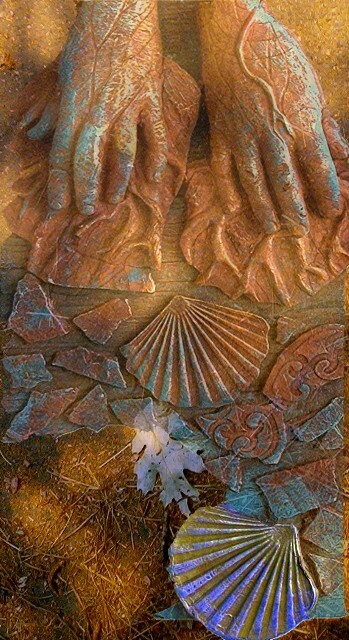 I have often thought that the Goddess, by whatever name, has always been with me, my particular work. 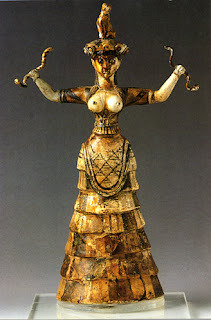 I remember when I was a little girl, the first paintings I ever did were of the bull dancers of ancient Knossos, and their snake entwined Goddess. 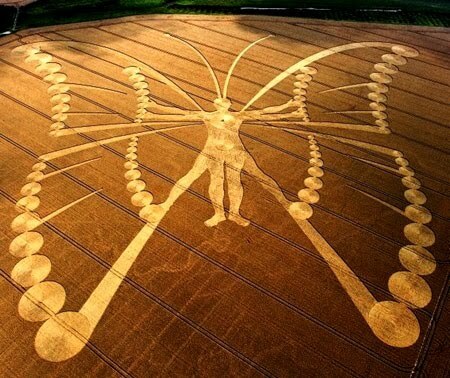 Memories from past lives? The Collective Unconscious? Or just an encounter with a National Geographic? I still have no idea why I just had to do those paintings, but I've been true to the impulse ever since, painting many, many Goddesses. And I wonder what my teacher in the '50's thought of an 8 year old's renderings of a bare-breasted woman. So, as a postscript to my mythic, synchronistic wanderings, and following the logic that synchronicities can be followed as one might a dream, I have to add this as the "grand finale". 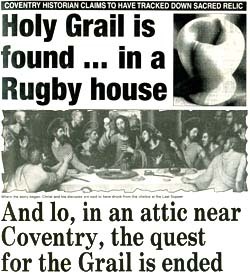 It was sent very kindly by Robur, who has been writing about the Grail, on New Year's Day: a blurb from a British paper announcing that the Holy Grail is to be found in Coventry! I'll take that as most auspicious! Again, pursuing this as interpreting a dream, I remember that "Coventry" means in the dictionary "banishment". What is the Holy Grail? To many feminist writers, the Grail is equated with the womb, a primal symbol, of course, of the the Great Mother. In the Christian/Judea/Islamic traditions we have inherited, God does not have a womb. How has or could culture be different, when the Deity or deities do have a womb? 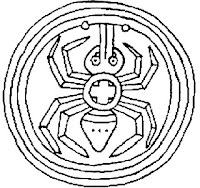 "Womb symbols" abound throughout ancient mythologies - one prevalent in England during early Christianity is the Celtic "cauldron of Cerridwen" . 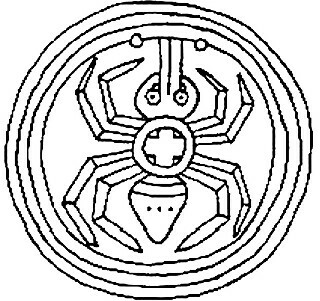 In the legend of the Grail, this generative symbol is transformed into the "cup of Christ". 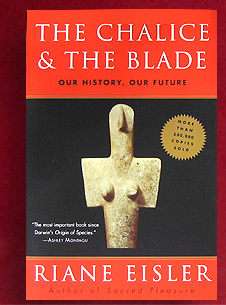 Riane Eisler, in her famous book "The Chalice and the Blade", used the symbol of the Grail, or Chalice, as a symbol for the Goddess, displaced, demeaned, and devalued gradually throughout patriarchal history. Exploring the meaning of all of these threads of synchronicities for myself, based upon learning about Lady Godiva and her ride through Coventry in the Middle Ages, I would have to say they all lead me back to "the return of the Goddess", once the May Queen of the "coven tree (coven-tree)", then "banished (Coventry) ", now returning, with all the healing power of the Grail, to a world in the midst of transformation. 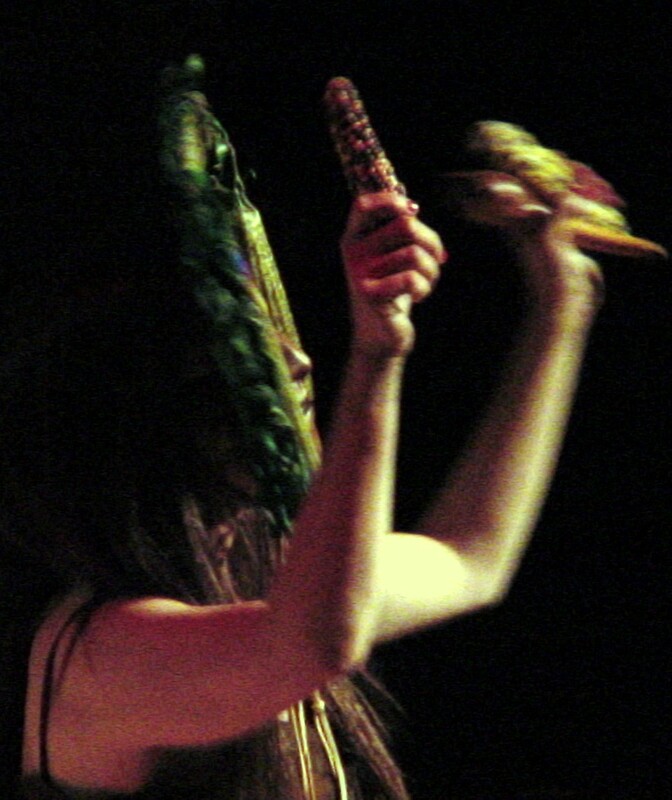 And at last, for me, all Goddesses become one Goddess: the primal Goddess, Gaia, Mother Earth.